This engaging collection of primary sources, selected fiction excerpts, and images explores important events, figures, and themes in European history, from 1789 to 1900. 19th Century Europe offers five types of selections: memoirs of individuals who witnessed important historical events; excerpts from works of fiction; writings of influential figures and theorists; significant historical documents, and images. Primary source selections acquaint students with the writings and documents that helped shape the long 19th century European history, while the fiction selections bring historical events to the level of human life. The selections explore significant themes of this time period-modernization, liberalism, and nationalism, society and culture, the relationship between the individual and society, and the relationship between Europe and the world-enhancing students' understanding of the historical events presented in course. 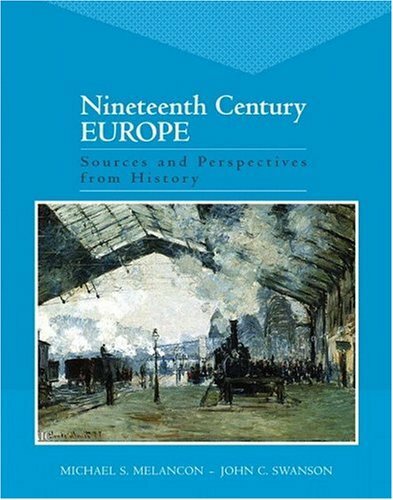 Both challenging and captivating, 19th Century Europe provides students with a glimpse of the emotions, ideologies, and attitudes that lie behind the facts and figures of history, allowing them to experience the past and to better understand it.